The Aegis Team could not be more proud of Payton Ritzel. A member of the Aegis Team for 5 years while in school and participating in ROTC, Payton received her MBA in December. In early May, she was commissioned alongside 17 others in her class. 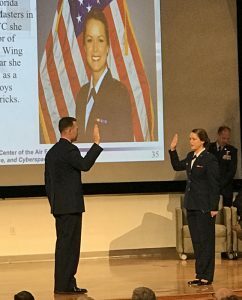 She was one of three with an advanced degree, which Air Force ROTC regulations require cadets earn within a single year. During the ceremony, Payton took the Oath of Office from her father, Lt. Colonel Scott Ritzel (shown at left). Payton will serve as an Air Force Combat Systems Officer (CSO). Thanks, Payton, for your contributions at Aegis, and thank you for your service to our country!